This hurricane photo was taken by a reader from Hattiesburg, Mississippi. What’s the forecast for this hurricane season? Get all your hurricane information. It’s official – the Atlantic Hurricane Season starts on June 1.So why did a number of weather blogs and services speculate on whether the Atlantic would get its first tropical storm during the second week of May? Why are other services expecting a possible storm or hurricane during the last two weeks of the month? Why is the hurricane season in such a hurry? The answer is that the Atlantic is really hot. The Gulf Stream is flowing very fast, carrying tropical warmth throughout the North Atlantic. 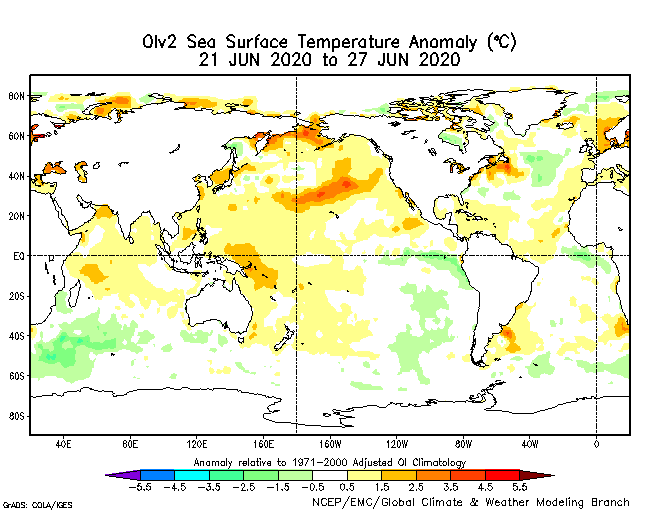 As a result, the North Atlantic is almost as warm as it normally is in JULY! On May 12 and 13, a strange little storm with a strange little name, Invest 92L, hit some hot Atlantic water and started to grow. It was in the middle of the Atlantic, as far north as the northern tip of Africa. Despite its odd name and location, (it was so far north), it started to grow, spin and act tropical. After a few hours of getting weather forecasters excited, it cooled down and fizzled. Sigh! No one wants a damaging storm. However, it is fun to watch nature’s giant storms swirl through the ocean and the southern US could really use some tropical moisture. Don’t give up on May, however. Several weather observers have noted that the winds will be more favorable towards the end of the month. Meanwhile, the waters are very warm. It could happen. After all, the East Pacific hurricane season is supposed to start on May 15 and Tropical Storm Aletta started one day early. Starting as a small storm off Acapulco, she swirled out to sea and blossomed into a tropical storm four hours before the official deadline. It has been a strange weather year. Why should anyone expect a “normal” hurricane season? As many informed weather buffs know, a large portion of the Atlantic was cool in April. The cool region was between Africa and Brazil and had little to no effect on US weather. Waters off the US were warmer than normal. In May, the Atlantic warmed. The latest satellite map of ocean temperatures shows the tropical Atlantic is warming and the waters off the Gulf and East Coast are still warmer than average. The temperatures are 0.5˚ to 3.5˚C (0.9˚ to 6.3˚ in good ol’ Fahrenheit) warmer than normal. The two cooler areas in the North Atlantic are flowing east towards Europe. If you are interested in ocean temperatures and want to get the latest information, I recommend http://www.emc.ncep.noaa.gov/research/cmb/sst_analysis/ . They update every Monday. ONE MORE FOOTNOTE – Tropical Storm Alberto started on May 19, four days after I posted this blog. A low drifted off the South Carolina coast, hit the hot water and grew into a tropical storm. Fortunately, experts say it will drift out to sea. Another storm developing on the gulf now i believe! In Virginia that tropical low has been with us for a few days now, so off and on thunderstorms have been going on every afternoon but it turns down right HOT this weekend. 80s all week and 90s this weekend then upper 80s plus the humidity late next week. Summer is coming! What caused that low to stay over us for so long? if you are familiar with the tropical low staying anchored on top of the mid-atlantic. I just dont want a tropical storm to hit because that leaves me with bad thunderstorms near the Blue Ridge. Thanks, Denise. The Gulf Stream is on steroids and pouring a lot of warm waters off our shores. The fishing fleets are reporting that warm water fish are arriving weeks earlier than normal. The Atlantic Sea Temp is Abnormally LOW at the moment. Where is the Nonsense coming from? There was a low temperature region between Africa and Brazil in April. It did not affect US weather. The region has warmed up. Yes indeed it has! 2012 has brought us strange weather that we havent saw in a while.. warmest march on record, march warmer than our april. Just when we think winter is over no its not! We have a foot of snow in April! Tornadoes peaked in March and April rather than May and June like normal. Its almost sad because i dont know what to expect anymore. Will things turn back to normal for us? our May is pretty normal so thats some recovery. Thanks Evelyn. So hard to believe its almost June. This year is going by really fast! !